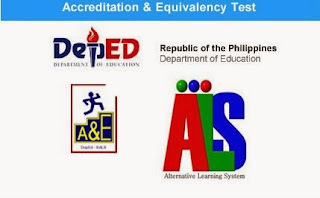 How do I register to DepEd's A&E Test? *School dropouts who are not employed and not old enough to acquire the mentioned documents must submit an Authenticated Birth Certificate. Who are qualified to register with ALS A&E? Qualified to register in the ALS A and E test includes elementary dropout who is at least 11 years old on or before the day of the test for the elementary level ALS A & E; high school dropouts, who is at least 15 years old on or before the day of the test for the secondary level ALS A & E test; non-passers of previous ALS A & E test/s; learners/completers of the ALS programs; and youth and adults although in school but overaged for elementary level (more than 11 years old) or for high school level (more than 15 years old). 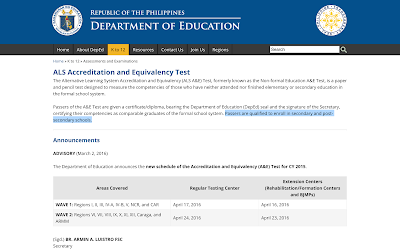 Paano mag-register para sa A&E ng DepEd?